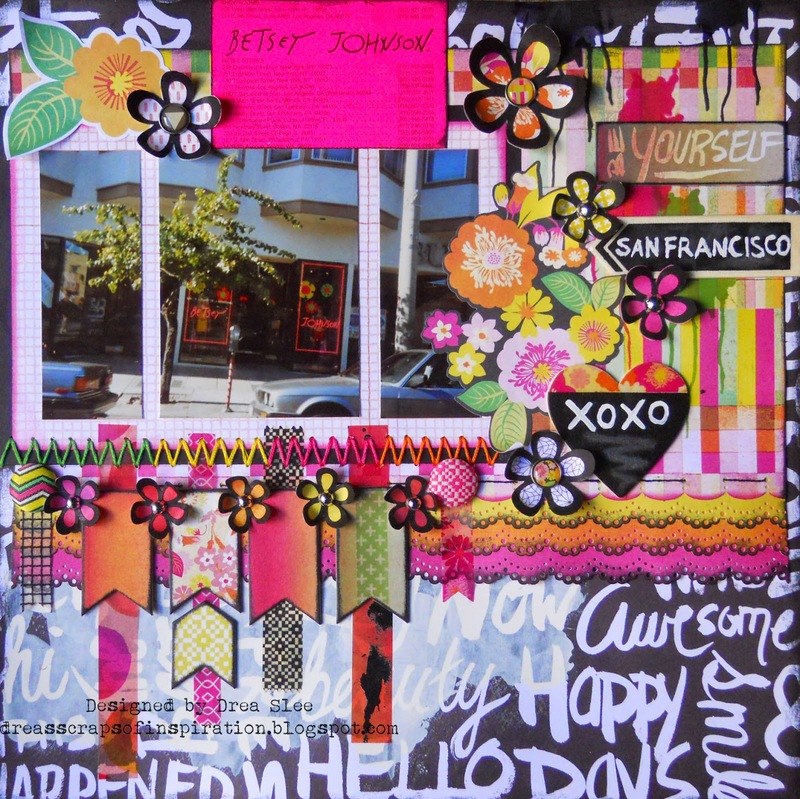 All of the bright, funky, colors and patterns in Basic Grey's Highline I Want It All Bundle, was exactly what I've been saving this 20 year old photo for. They just screamed Betsey to me, as she's always been one of my favorite fashion designers. This is a photo of her store in San Francisco, CA with her business card attached on top. I had so much fun working on this page, and started off by using gesso on the bottom of my paper.The banner was created using the Printed Chipboard Shapes and Vellum Tape. I attached 2 of the large Mixed Brads on the ends, and finished it off with a zigzag stitch in four different colors. I cut the black flowers with my Cricut Expression, and backed them with some of the papers in the 12 x 12 Collection Pack. I used some more of the mixed brads for some of the centers, adding silver studs from my own stash to the rest. 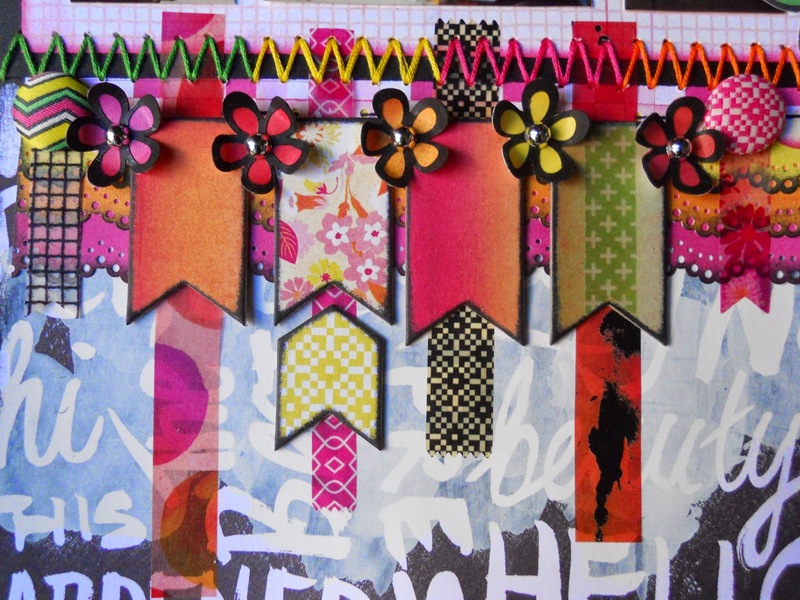 The other flowers around the photo come in the Die Cuts and Transparencies pack. The drips and splotches were masked with a stencil and inks. 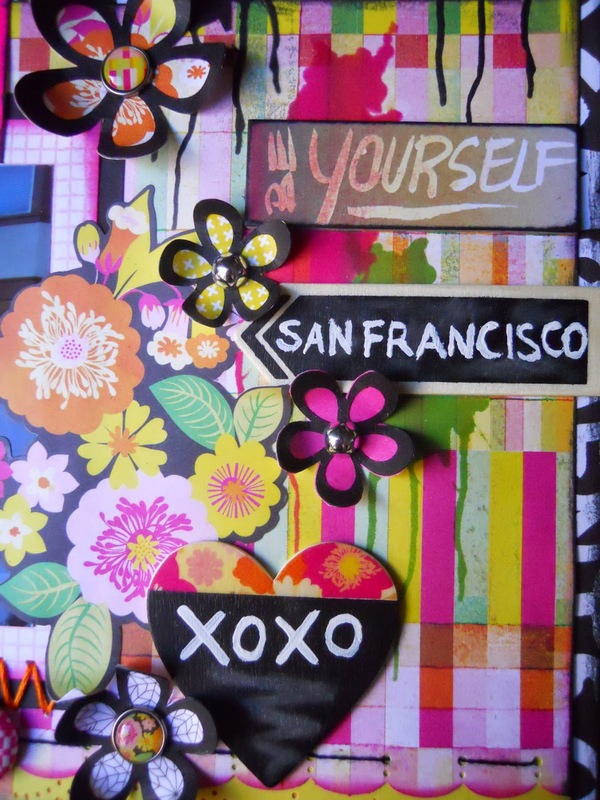 I used white paint to spell San Francisco and XOXO on the Chalkboard Wood Tags, using some more Vellum Tape on the wood portion of the heart. Then I rubbed a little chalk to both pieces. Thanks for your visit, and be sure to pick up your bundle at FotoBella!